My son plays soccer, but <i>we</i> don’t play soccer. When did that become a bad thing? I’m becoming a soccer mom. That’s something I never thought I’d say. But as I sit on the edge of my camp chair and watch my six-year-old son boot the ball from the backfield, I am into it. I am proud. And I brought the snacks. When I was a kid, playing the sport in New Jersey in the 1980s, there was no expectation that parents (apart from the coaches, the carpool driver, and the one mom who always brought orange slices and Gatorade) would go to every game. My family and my friends’ families never ceded the majority of their free time to our sports. Extracurriculars—soccer, and later field hockey and lacrosse—were something I did, not something we did. That was the norm. It’s different today. Hyperinvolved parenting is nothing new, but the scale of today’s version feels unprecedented. Families are all up in their kids’ sports lives. They go to every home game. They go to every away game. Tournaments that last all day, all weekend. Games in which their children won’t be playing because they’re injured. Practices. Private coaching sessions. And they’re doing it year-round. From where I sit, with a kid who’s still too young to have away games or tournaments, this seems excessive. I already dedicate so much of my life to my children. Do I have to give away what’s left and abandon my hobbies for theirs? How did we get here? How has this become normal? 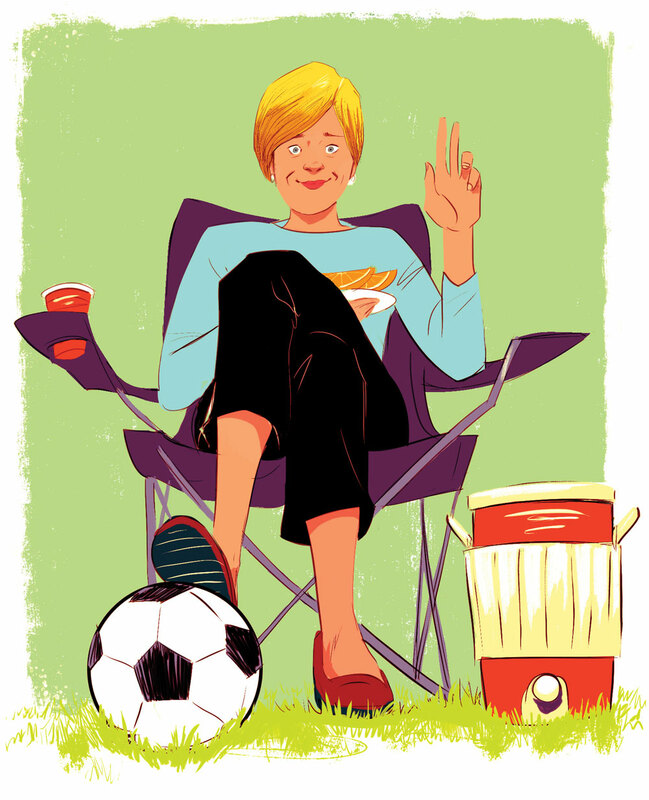 Some soccer parents say they do it to make up for time missed with their kids during the week. (Four decades ago, just one of four moms worked outside the house. Today two out of three do.) Some say they feel peer pressure from other parents and don’t want their kid to be the only one without a loving fan on the sidelines. Others show up because they just like to watch their kids do something they enjoy. Most often it seems to be a little bit of all of the above. It’s become cool to make fun of helicopter parents. Like hipsters, no one self-identifies as such, so we have carte blanche to mock them. Our smugness is reinforced by bestsellers like Bringing Up Bébé: One American Mother Discovers the Wisdom of French Parenting and The Battle Hymn of the Tiger Mother, which warn us to stop coddling our kids and waiting on them hand and foot. I could easily say that, with sports, my parents’ model of loving detachment was good enough for me, so it’s good enough for my kid. But I can’t deny there’s a system in place that measures a parent’s love for her child by how often that parent shows up. The kids didn’t create this system. We did. We’ve conditioned them to look for us on the sidelines. What I’ll have to decide is: Will I be there or not? The thing is, kids are pretty flexible. When I told my son I wouldn’t make it to every one of his weekly Community Circle events at elementary school—it’s too hot and I’m too short for him to see me in the crowd—he shrugged. He knows I’ll be with him after school, for dinner, and at bedtime. He knows I love him. So can I take a similar stand when it comes to away games? I don’t know. I hope I’ll compromise and go when he asks me to and when the timing works. I’ll try to remember that it’s important for grown-ups to have their own lives. Kids need to see that because it teaches them the value of having their own lives, too. They won’t grow up feeling like their parents gave up everything for them; that’s a difficult emotional debt to repay. Hopefully I’ll remember that I can support my son, love him, cheer him on—from near or far—and be a soccer mom without losing myself. And I’ll try to remember that soccer isn’t something I do, not anymore. It’s not something we do. It’s something he does.